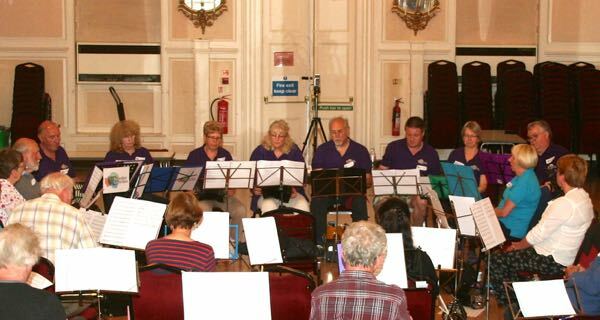 Our musical director Paul Barrett lead our concertina band day which took place in the magnificent ballroom at Stamford Arts Centre. The tunes varied from traditional melodies to modern pop songs, all ably arranged for treble, baritone and bass concertinas. There was even a guest appearance from a piccolo concertina. There was a mixture of straightforward and more challenging pieces all of which the players tackled with enjoyment and enthusiasm. Everyone agreed that it was a great day and we look forward to next year! Turn on (and off) each player in turn to hear some of the tunes we learnt during the day. Turn on (and off) each player in turn to hear us. Turn on (and off) the player to hear them. All text, pictures, music and layouts are copyright and must not be used without written permission.